Before you enjoy a good time over St. Patrick’s Day weekend, lace up your running shoes to help a great cause. The 4th annual St. Paddy’s Day Dash & Bash is a fundraising event benefiting local children’s charities. The Dash & Bash is a unique event that is fun for the entire family! Not only does it feature a certified 5K walk/run including a costume contest, but the Dash & Bash also offers a family friendly post-race celebration including a Kids Fun Run, bounce houses, face painting, musical entertainment, food, and green adult beverages in celebration of St. Patrick’s Day! The race is on Saturday, March 14, at Fluor Field at the West End (945 S. Main St.) in Greenville. If you run, you get free admission for the First Pitch Invitational college baseball tournament at Fluor Field, with the host Furman University playing Michigan State, and University of South Carolina-Upstate taking on Connecticut. The festivities at the game include live music, a costume contest, silent auction and more green beverages. We at Wheels For Wishes hope you will join in celebrating this 4th annual event of raising funds and awareness for local children’s charities that make a positive impact and difference in the lives of children in Greenville County. Make-A-Wish South Carolina is one of the charities that will benefit from this year’s event, so when you participate, you’ll be helping grant wishes for South Carolina kids. 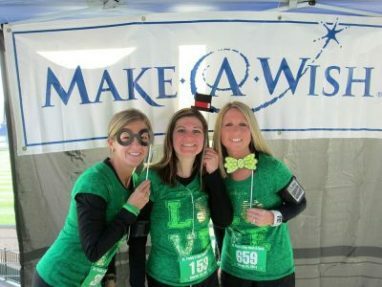 There are ways you can help Make-A-Wish South Carolina without going to the St. Paddy’s Day Dash & Bash. One way is to donate airline miles to help send Wish Kids and their families on their wish trips. Another way is to donate an unwanted vehicle to Wheels For Wishes benefiting Make-A-Wish South Carolina. Donating a vehicle helps kids in Columbia, Charleston and throughout the Palmetto State. But it also saves you time and money that you would otherwise spend on getting rid of an unwanted vehicle. That unwanted vehicle will be transformed into a wish for a local child and gives you a great tax deduction at the same time. Wheels For Wishes is an IRS-registered 501(c)(3) nonprofit organization, and your donation is 100 percent tax deductible. Your car can make a wish come true!